There is only 7 weeks left for Sam and I until we are jetting off to the land of the free. I have been busy organising our accommodation, car hire and researching places to go and things to do, but the first thing on our agenda in attending Viva Las Vegas for the very first time! I am so excited to be going. We got in early and booked a room at The Orleans about a year ago- I heard you’re not doing Viva right unless you are staying where all the action is! One of the things I am looking forward to the most is meeting people. So if there are any people out there who read my blog and recognise my face at Viva, please come and say hello- I would love to meet you! Of course I am excited for the music too. I think JD McPherson will be my highlight. All of my girlfriends are very jealous of me..hehe. I also get to see Big Sandy twice in one month, in two different countries! He is headlining Kustom Kulture 10, here in Adelaide, and is also playing a few spots around Melbourne and Brisbane next month. The pool party looks like a whole lot of fun, and I can't wait to get my very own Boot! Sam is looking forward to the car show, and seeing the Ventures will be a treat too. So...who else is going? Have you got any tips for this VLV virgin? I would love to hear what you are looking forward to. If I see you I will totally say "Hi". I went last year for the first time, I saw a ton of bloggers but was to shy to say hello! The pre party on Wednesday on Fremont street, put on by Wild records was amazing. That is one of those things not promoted to outsiders very well, but was one of the highlights of my trip. Highly recommend it. It is worth the pricey cover. Your gonna have a blast! Oh i am so very very jealous!!! I have been wanting to go to Viva for a long time, but thought it wouldn't be much fun if I was under 21, and then I got engaged so we decided to go as our bleated honeymoon, so it has been a long time coming. If you want to go to the museum, it is best to buy tickets online before you go. I plan to do a blogger meet-up because VLV is huge! Meeting people by chance is very difficult if not impossible. The meet up sounds great, Tara...I am definatly in! I'll have to buy your a birthday beverage! We have plans to go to Frankie's, and hopefully collect all the mugs ;) And the neon museum is also on my "to do" list, thanks for the website. I currently live in vegas and have been attending Viva since i was 12 (im 18 now). Its always soo much fun and great memories are always created there. I will definetly say hi if i see you there!! Wow, 6 VLV's under your belt and your not even 21 yet! Please do say hello! I am also a VLV virgin and this is my first year. If I see you I'll be sure to say hello! I will come for France to VLV in April. It will be my second time there. I think that VLV is somtime too huge. Vintage market is the place to be for me! I would prefer a car show with some original 40's-50's cars, too much crazy customs for me! I think I prefer european R&R weekenders but VLV is a nice excuse to make a long trip in California!!!! 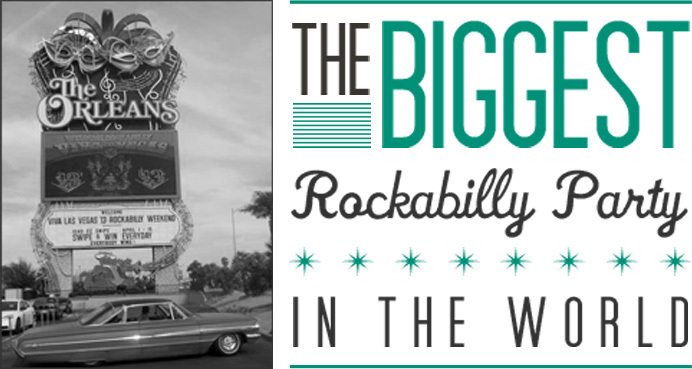 I have heard that it just keeps getting bigger and bigger each year, and one year I would love to make it over to europe for High Rockabilly. I'm behind on my blog reading, but am glad to see you're making the long trip to Viva! There is an official unofficial meet and greet (aka Pea's Hooch and Smooch) on Thursday night. You should go if you're in by then! Frankie's is a definite must do - just be sure to leave enough room in your suitcase to take back all your mugs!